I have made no secret about this but one of my biggest fears is acrophobia, which is also known as the fear of heights. Before watching this film, I figured it would be about the main character dealing with his acrophobia, but surprisingly not and that definitely made the film more interesting. 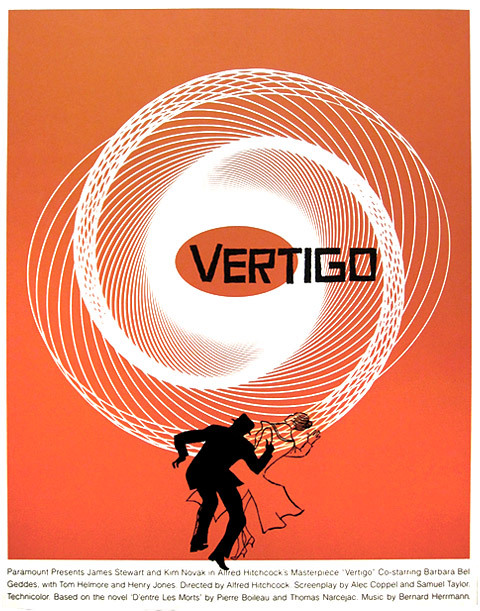 Vertigo is about a former policeman named Scottie (James Stewart) who retires after an accident involving a fellow policeman and his fear of heights. He is then called back into action by a colleague named Gavin (Tom Helmore) who asks him to investigate his wife Madeline (Kim Novak) who believes she is being possessed by her great-grandmother. Along the way, Scottie finds himself becoming infatuated with her. Since this is a Hitchcock film, I would normally talk about the direction first, but I won't here. His direction was of course outstanding, but I'd rather discuss the concept first. The film is somewhat of a noir thriller as it deals with an average Joe being caught up with a femme fatale, has some ambiguous supernatural elements, deals with one of humanity's most common fears as well as the theme of "chasing old ghosts", so to speak. So, major kudos to the person who wrote the original story the film is based on and the visionaries who made the film, especially the late great Hitchcock. Now onto his direction. In this film, Hitchcock manages to use dizzy camera shots to make those who watch the film feel how Scottie feels when he is getting vertigo and I thought that was a nice touch. Another thing that I really liked was the performances. James Stewart really shines as the dynamic Scottie, who as the film progresses becomes more obsessive yet hopelessly in love. He doesn't necessarily play George Bailey, but he certainly doesn't play Norman Bates. Kim Novak is also fantastic as Madeleine, the object of Scottie's affection. I found Novak to be both haunting and towards the end, heartbreaking. But another actress I'd like to acknowledge is Barbara Bel Geddes who plays Scottie's confidante Midge. Bel Geddes is rather enigmatic as Midge and kind of has you wondering what is up with her. Overall, Vertigo is an intense thriller that more than earns its reputation as a classic. It has romance, intrigue, horror, and great performances, especially from Stewart and Novak. This is one you do not want to miss. I have a feeling it may leave some confused, or feeling "dizzy", if you will, but it is worth the two hours.